OK -- here's a capital treasure adventure story that should raise an eyebrow or two. Some thirty-five years ago I began to write a short story about the native Miami Indians of Southern Florida where I once lived -- and over the years, the story grew into a more complex research book project that focused on how the natives of the New World could have influenced the subject of Atlantis. In 1988, I self published the book entitled: SPIRIT OF ATLANTIS / The Treasure Adventure -- and received the following press review from the former Editor of THE FREE PRESS, Dave Whitney on 7/12/89. 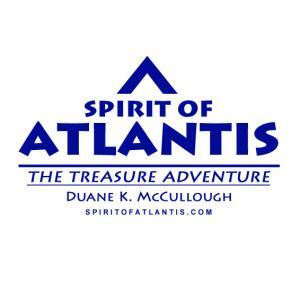 "If you want to spend more than a couple of evenings into a local publishing effort, tackle Duane K. McCullough's SPIRIT OF ATLANTIS - The Treasure Adventure. By realigning historical time, McCullough argues an excellent case for the existence of Atlantis ... and that the cultures that created Atlantis influenced much of the development of the civilized world, including Greece and Rome. McCullough believes that viable means of air transportation and radio communication during the age of Atlantis, and these, coupled with the seafaring nature of the Atlantis civilization, helped spread their influence worldwide. McCullough's history of the Indians who inhabited South Florida and their ancient migrations to other areas of the globe makes most interesting reading. This publication is almost more of a project than a book. It is being produced in versions as McCullough updates his data. For the adventuresome, or just the curious, this effort provides a lot of food for thought. It's worth spending a lot of time with." Now, some 25 years later -- and after over a decade of self publishing my research project on the Internet, I have decided to republish much of the artwork from the project here at Fine Art America within a series of image prints that can be found in my SPIRIT OF ATLANTIS Gallery. I have added new commentary within the image prints to help viewers better understand the many scientific and complicated historical concepts presented from the research project. Most of the original artwork within the image prints now seem somewhat crude compared to what modern graphic software programs can do today -- but a kind of "retro" appearance about the artwork, which was created on my old Atari computer, gives a kind of "feeling from the past" that seems appropriate in this presentation situation. I realize that many new viewers of my research will consider it pseudo-science and will want to disagree with some of my theories regarding what was, where was and when Atlantis existed in historical time -- but, I can only hope that they will have an open mind to the whole story told before passing judgement and assuming my theories are wrong. Also check out the following Press Release statement found at the FAA members PR link page entitled: Artwork from the SPIRIT OF ATLANTIS research project by Duane McCullough is now available at Fine Art America. Brevard, NC -- Artist and author Duane K. McCullough of the SPIRIT OF ATLANTIS research project, has posted today a new series of ten image prints from the project that reveal many novel scientific views about the lost civilization of Atlantis. The image series illustrate numerous visual concepts of what was, where was, and what became of history's greatest mystery. Available at McCullough's Fine Art America website within his SPIRIT OF ATLANTIS Gallery -- the image print series include new commentary to help understand the many complex theories that cover various scientific subjects. By reinterpreting Plato's Atlantean dialogues with modern global maps -- and by correcting several major numerical mistakes within the historical timeline of the conventional A.D. calendar, McCullough argues the extraordinary view that the lost capital seaport city of Atlantis once existed in Central America less than a thousand years ago. McCullough also claims that ten prehistoric maritime kingdoms -- known as the Atlanteans, once existed in antediluvian times and that they influenced much of early Western Civilization with remarkable communication and transportation technology. Moreover, McCullough believes the capital seaport city of Atlantis was engulfed by the same devastating flood event as mentioned in the Holy Bible -- which was caused by a celestial incident when a rogue comet vaporized into the surface of our Sun and produced a major solar flair event that resulted in a global atmospheric disaster. Although McCullough's research project has been updated over the years at his personal website since 1997, it has received virtually no publicity by any media service since it was self published some twenty-five years ago. Version 3.4 of the SPIRIT OF ATLANTIS / The Treasure Adventure research project can be found at the Spirit of Atlantis website.